Our soon-to-be productive beds. We installed hardware (aka PVC pipe) that will allow us to make these into hoop houses in the winter and spring. Additionally, I got some of the flowers and shrubs that I picked up over the past few weeks into the ground along the edges. I'm hesitant to get too carried away because I need to buy a few trees and get those placed in the right spots before I fill in with smaller landscaping AND I don't want to spend a fortune watering these little babes all summer to get them established. But, the fun of plant shopping continues to call to me so I'll probably succumb somewhat. We had an action packed weekend and writing this I am pretty proud of us for getting it all in. On Saturday, we trucked it out to the lumber yard to pick up all of the trim for our new deck railing. Justin and I chopped it all up to size and sanded and primed the pieces to ready them for installation. We are going to get them all painted up with their final coat before we install them and then just touch them up once they're installed. On Sunday morning (well, really it was about noon by the time we got underway) we bicycled over to Alki Beach for lunch. Returning, we dug right in with our paint brushes, applying another coat and running ourselves out of paint. With plenty of energy remaining (joking), Justin decided to take on mending the fence. We have to replace one of the posts since it rotted and fell over and then mount the end of the fence onto a new post. Here's Justin in demo mode; his favorite job. You can really visualize our yard now. We finished up one raised bed and got the pieces cut for the second so it should be a quick and easy assembly. But maneuvering one bed into place has really given us a picture of what the rest of the yard will look like. All of a sudden we have margins along the edges for flower beds and I'm starting to imagine where a few trees will go for privacy and shade. I think I'll plant a summer crop of zucchini and cucumbers in these beds since there's no point letting them lie fallow all summer. It's June 20 and the summer solstice is tomorrow but apparently Mother Nature didn't get the memo. For starters, it's been unseasonably cold (like high 50s) and then there is all the rain. Don't get me wrong, I love the rain -- especially for all the new plants I've got in the ground, but it sure puts a damper on outdoor activities. This weekend, we had two major outdoor activities planned: a scavenger hunt and a garden project. The scavenger hunt was a blast although our out-of-shape bodies are feeling the next-day burn now. The garden project was a bit of a bust. So much for building raised beds in the backyard...we got drenched prepping the area for our project and bailed out before getting to the real meat & potatoes. This is us on our scavenger hunt (the answer to the clue in the background on that blue awning) expressing our attitudes for the weather. Seriously, we were having fun! This is as far as we got. Boo hoo -- no raised beds this weekend. But, we did remove all of the concrete forms and transfer some of our garden soil into place so that's about all I have to show. Oh, that and a final conclusion to our dilemma with the stair(s) to the garage. Yes, that's right folks, I can move mighty boulders with my bare hands (and a little help from my old friend Archimedes). Since my partner in crime was laid up sick on the couch with a nasty cold that yours truly passed along, I had no one to help me so I had to do it myself. Last Monday, Justin and I maneuvered all of the stones for the walkway into place but did not set them in sand. I was sick on the couch that day but got up to lend my She-Ra muscles to the task. 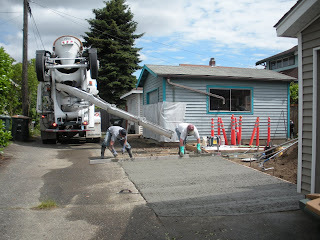 Justin had arranged for the concrete worker to come on Tuesday and start forming and installing the rebar grid and we needed to figure out precisely where the walkway would end to meet up with the concrete. All formed up and ready for the concrete. Our concrete finisher will be back on Wednesday to finish the job! On Saturday, I piddled around with some low-impact chores because I still wasn't feeling top notch while Justin volunteered as the safety man and gopher for an on-the-water scavenger hunt. I wouldn't say I was 100% well on Sunday either but way better off than Justin and well enough to build a walkway. I decided that a little sweat might be just what I needed to kick this cold. Here's the (almost) finished project. We still need one more stone at the end which we don't yet own and we can't place until the concrete is set and the form is removed. It took one dump truck and one excavator and one Saturday morning and we finally have a flat yard with no extra dirt. We figure that we got rid of about 30 yards of dirt from this tiny Seattle lot which is amazing. The yard was pretty flat to begin with but it was about a foot higher in most spots than it is now. We'll be bringing in some quality soil to use for a top layer so that our garden can thrive but it will be a lot less than 30 yards. Here's Dan loading the truck up one shovel at a time. Thanks Dan! After the dirt was long gone, Justin got to work on framing up our walkway to the alley and tamping the gravel into place. Meanwhile, I busied myself digging up weeds in the yard. I'm a bit concerned of what lies beneath this lovely bare soil. Just two months ago, this was a thriving weed patch and I'm not so naive to believe that scraping off the top layer will do away with the former crop. I'm especially wary of the morning glory that has been poking out of nearly every corner of the yard despite my futile attempts at eradication. Here's the tamped down base for the future path to the alley. Where the gravel stops, we'll be installing concrete the total width of the lot to provide a small parking spot, driveway into the garage and pad for the garbage cans. On Sunday I wanted to get some plants in the ground. I've been busy picking up plants here and there over the past few weeks and I was anxious to arrange them and plant them. After raining all night, the soil was heavy and muddy so I quickly made a mess of everything traipsing through the dirt. But, I got the east side of the patio completely planted, save for one hebe that I still need to find and buy. I can't wait until these plants grow up a bit and fill in. Here's the spot on the north side of the stairs to the deck. The featured plant is a variegated red twig dogwood which should get as tall as the deck. Looking south, I've got a ninebark plant, privet, yarrow, several barberry plants and a few daylilies. I'll be looking for an exciting clematis in a hot color to train up the trellis. After a bunch of desperate calls to tree services, we finally got a load of wood chips for mulch. Heaven sent! Apparently tree mulch is in high demand or tree services are in low demand because we've been asking for months for a load. Today, some random caller offered me a load and I didn't even recognize the company name as one that I had called, but I've been spreading my name and address and phone number around like I'm looking for trouble. Who wants to bet that we end up with more mulch than we could ever dream of using? It's bound to happen. Justin and I spent about an hour spreading the whole pile around the yard, hoping that the weedlings will choke on the mulch and die under it's woody goodness. I've been keeping them at bay with regular tending but they keep popping up, especially after all the glorious rain we've had.